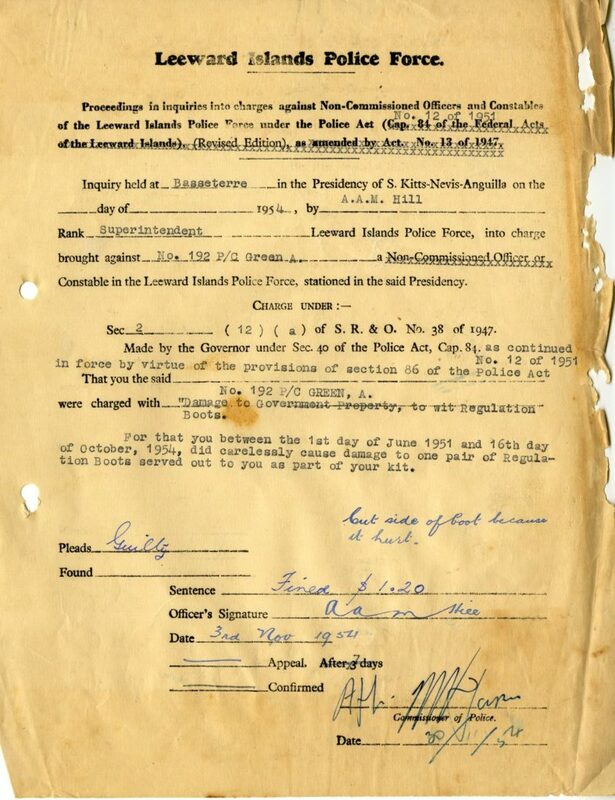 We are continuing with interesting material found in the personnel files of the Leeward Islands Police Force. In 1954 PC Green was charged with causing damage to government property. He had cut the side of a pair of boots issued to him as part of his kit. In today’s world the first question that pops into one’s head is – Why did he not ask for another pair? But this was over 60 years ago. Things were different then and the authorities took economy seriously, sometimes even at the risk of a persons wellbeing. Perhaps the first question we should ask is – Could he have requested another pair? Note that the charge covers a period from the 1st June 1951 to the 16 October 1954. Does this mean that the boots were meant to last for over four years? How often did the authorities order fresh pairs? Were the foot sizes taken into consideration? Were extra pairs ordered? How much longer would Green have had to wait for a replacement pair? At what point in those four years did he cut the boots? In those days, shoes and boots were made to last and there were cobblers who could extend their life. But this was a policeman who was probably on his feet most of the day while on duty. It would have been unbearable to wear in a pair of issued boots that did not fit well. It was also undignified for the Constable’s toes to be sticking out of his boots. Poor man!! !